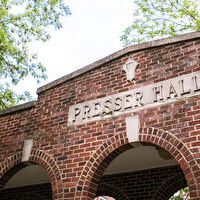 Presser Hall was built in 1930 as a result of the Luther fire. In 1978, it was completely renovated. The building was made possible by a gift from the Presser Foundation and it houses the College of Visual and Performing Arts - including music and performance studies. Classrooms, faculty offices, as well as piano and organ practice rooms are in this building. The north end of the building contains Hughes Recital Hall, a 300-seat acoustically perfect recital hall that was renovated in 1976. Absolutely beautiful! Wish I could go again! One of the best small ensembles I’ve seen in my life time!!! I loved every minute! Exciting and entertaining! foot stompin' good time! My husband and I attended and couldn't sit still. These guys translated Tommy with so much energy and feeling. Amazing talent! I enjoyed the Mariachi band, they were full of energy. They were amazing! Super authentic, I took my family to see them as well and being from Hispanic heritage it was definitely some of the best mariachi I've heard in a long time! !